As you are reading this, I am jetting away to Palm Springs, CA. A much needed respite and as I have never been there, I am super excited. I can't wait to people watch! I actually wore this outfit last Wednesday when we had our fabulous cool snap. I couldn't resist getting out the boots and scarf. I decided to do a little dot to dot print mixing or matching depending on your take. probably all the other winter shoes in my closet. That will have to wait until I get back from my little vacay. but hope to take lots of pictures while away. Have you ever been to Palm Springs? What is one thing you highly recommend to do while there? 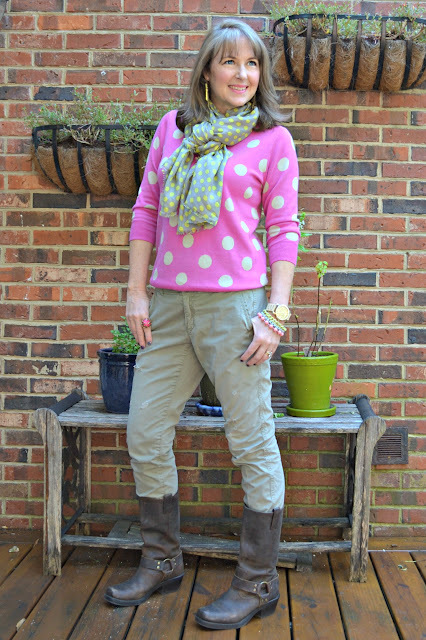 Love the mix of dots and the look of those boots! I'm still waiting for it get cool enough to wear boots around here. Enjoy Palm Springs, I was there many, many years ago and it was just lovely! I'm in boots today too! Love your dotty mixture. I almost stopped reading after your opening sentence - so jealous! 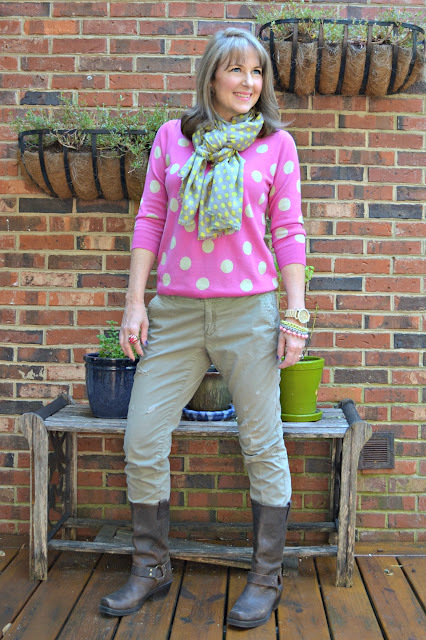 Love your dots, bright and cheerful on these drizzly days we've been enjoying in NC, almost like the UK or Seattle! Hope your getaway is relaxing. have so much fun! Don't polish your boots- they are supposed to look distressed! Those are great Frye knock-offs Target did! Have fun! I love your double dots! Have a terrific vacay in CA! I doubt you'll need those cute boots there! Love how you mixed dots! I've never been to Palm Springs, but I do love Cali. Hope you have a great trip! Oooh Palm Springs, one city I haven't been to in CA but have always wanted to! Take lots of pics for us (and some people watching ones if you can swing it!) Love the dots and I hear ya on the boots- mine are all ruined from snow and pavement salt! what a cute pattern mix! i love double dots! I have that same sweater in navy and I love it. The pink is super cute paired with the neutrals! Oohh have fun in Palm Springs! I just love that sweater! 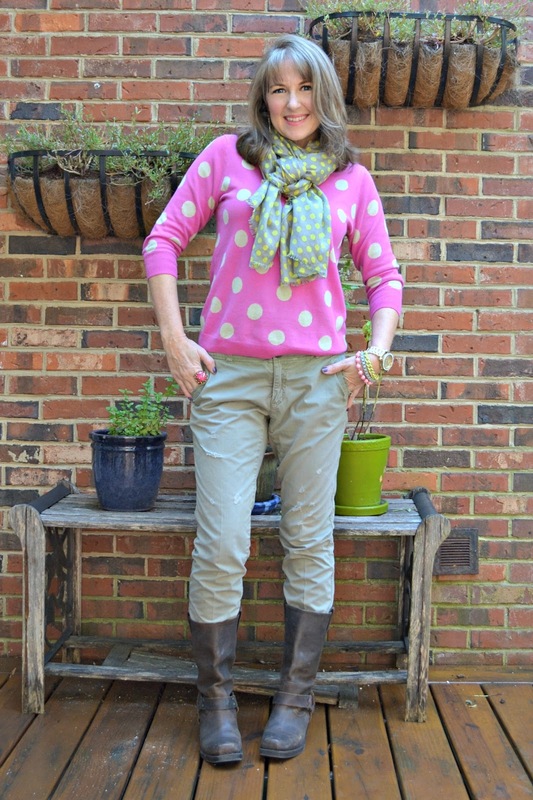 and the scarf too - who can resist polka dots? I am so terribly jealous of your vacation! This dot mixing looks great and it's so subtle I almost didn't notice it. I also have to find my harness boots, which I'm sure could use a little TLC before winter sets in! This is such a fun look, I love the double dots!! I hope you're having fun (had fun?) in Palm Springs. I've never been before, but it sounds like an amazing place to go!